ABC (Australian Broadcasting Corporation) TV occasionally comes up with some absolute rippers when it comes to crime shows. They have history of making some of the best, and often most unwatched crime dramas on Australian television. I guess that’s the nature of being a government broadcaster; you get to make the kind of television that commercial networks would find too risky. 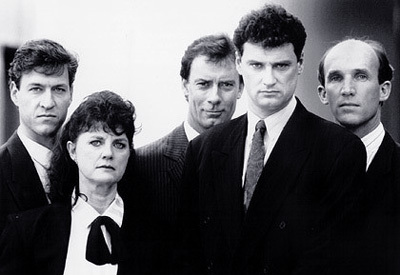 If you’re over the tripe of forensic investigators with magical pieces of equipment, gangsters that spend half the time posing in fashion, and episodes that are too short to really draw you in, I suggest you grab hold of a series called ‘Phoenix‘ on DVD. If you want real a Melbourne crime drama, skip ‘Underbelly‘ and head to this series first. Phoenix, now, is almost a couple of decades old now, but as it was a re-telling of a story that happened a decade prior to when it was filmed, it will always be watchable. It’s a semi fictional re-telling of the events surrounding the Russell Street bombing. Phoenix cast – in all their 90’s fashion glory. Once you’re done with that, I suggest you grab the two episodes of Jack Irish which have been filmed so far, and then get hold of a more Sydney centric series called ‘Blue murder‘. But don’t mistake the latter with the British or Canadian series by the same name. With the exception of Underbelly, all of the series above a so gritty, that you’ll almost feel the dirt growing under your fingernails. In the case of Underbelly, the dirt is oddly sugar-coated. There’s something about Melbourne and the state of Victoria that seems to lend it self to crime shows such as these. The real-life organized crime in Victoria is a sloppy and ineffective mess. I used to work at the Queen Victoria Market in Melbourne, and there was a substantial amount of Russian mafia in the place. But ask any trader if it was dangerous working there with the Russian mafia, and they’d laugh at you. Melbourne’s gangland war, so awfully depicted in the first Underbelly series cost the lives of three people that worked in the market – including a kid that I knew by the name of Benji, which used to have pizza with us every so often for Sunday lunch, while we worked our stalls. But that’s how the Vic market was – it had more community than mobsters. But there’s so much dark brutality in Melbourne’s history, that it always makes compelling television. But putting that aside, the ABC in the last 12 months aired a couple of great crime series of a very different nature. While the ABC are no strangers to costume drama, they don’t often indulge in mixing it with the crime genre. However they did, and the results have been… interesting. Firstly, they produced a series called ‘Miss Fisher’s Mysteries’, which is based on the Kerry Greenwood Phryne Fisher books. By the standards of the ABC, this series is utter fluff. And largely fun fluff at that. Ms Jane was a huge fan of the books, and naturally it became compulsory viewing in our house. Set in the 1920’s, again, the series is all about Melbourne. And like so much of Melbourne, it is rather all about fashion, dark alleys and dodgy operators. The series was fun, and nicely skims a few facts of Melbourne’s history. This series was largely targeted at a women. It had nothing of the grit and complexity of previous efforts by the ABC, and I’m guessing that’s exactly what they were aiming for. 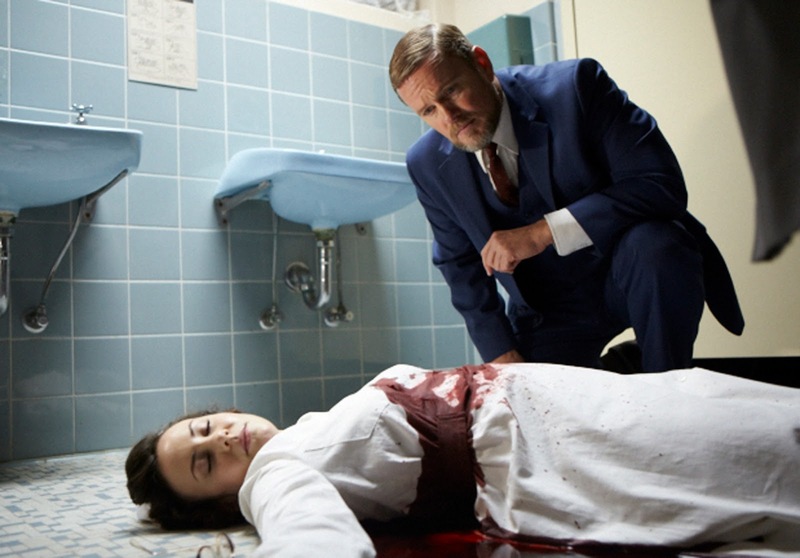 Now… Dr Blake isn’t exactly gritty television, but he does have a couple of great things going for him. Firstly, he has a damn beautiful Rheinmetall typewriter. In fact, the whole show is a typewriter spotter’s delight. And yes, he does often use this Rheinmetall during the series. It is embarrassing to admit this, but I’ve found Craig McLachlan‘s acting to be excellent in this series. Craig has in the past been a beacon for everything rubbish. He’s been a soap star who has transitioned across several teenage soaps, and a god-awful musician. This time around he seems to have eschewed his boyishness and grown a beard. Previously Craig’s efforts have been something of a focal point of derision – often quite unwarranted. Then again, he’s being supported by a very talented actor by the name of Nadine Garner. 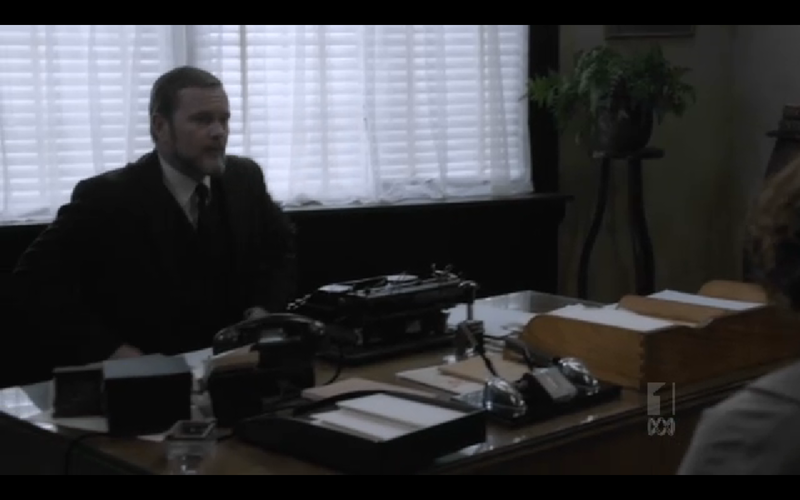 Looking at Dr Blake’s desk, I can see the Art Deco desk set that I was out-bid on last year. BASTARDS! Anyway….. It’s 1959. Dr Blake is a private GP that often advises the police surgeon on cases. While Dr Blake has made me want to have a Rheinmetall of my own on my desk, there’s other parts of this series that makes it fit nicely into the ABC’s crime drama lot: Here’s the rules, and how Dr Blake stacks up to them. Melbourne Location: Okay, it’s not set in Melbourne, but about an hour and bit outside of it in the former gold-rush town of Ballarat. Alcohol: Yep, Blake drinks like a fish. He drinks to cope, think, forget and remember. He even gets himself so sh*tfaced, that he turns up at major high end social events and abuses visiting British officials, before punching his cop mate in the face. Odd relationship with cop mates: You’re never sure if Blake is a friend or an annoyance to the local constabulary that he advises, until the head cop rocks up to his house with a bottle of something, and they proceed to get sh*tfaced. Something that was a bit of a theme in the ‘Phoenix’ series. Hangs out at the pub: Jack Irish, Phoenix, Blue murder, Janus, all these series managed a bit of pub love, and Dr Blake is no exception. He’s either at the pub, or the gentleman’s club. The very first episode even references the controversy surrounding ‘Chloe’, a painting that now hangs on the wall in the Young and Jacksons pub in Melbourne. Swearing: This is the 50’s ol’ son. There’s no swearing here! Central character with a tormented past: Jack Irish saw his girlfriend gunned down by one of his clients in his series, while Dr Blake has a family missing in Singapore – where he was located when the Japanese invaded during WW2. He spends parts of the series going through private artifacts of his life with his family that he fears are lost. His anguish provides much of his motivation through the series, as he occasionally lashes out at people in frustration. Police brutality: It wouldn’t be proper to have a series set in Victoria that doesn’t have the cops thumping the crap out of the crims. Although this series tends to see the cops being regretful afterwards. As far as costume dramas are concerned, the ABC have gone a long, long way towards accuracy with this one. The phones, the cars, the badges on the taxis. The upholstery on the furniture. And even the typewriters, have been meticulously researched and picked – and have all been the sort of things you’d expect to find in the sets that depict the era. And that’s what I really love about this series. The hospital looks like a hospital in the 50’s. The Doctor’s surgery is a very typical home adapted into a surgery of the era. Ballarat looks 50’s. The cops look 50’s. The nurses look 50’s. The factories look 50’s. The research and setting has been extraordinary. So anyway.. Here’s a couple more screen grabs for you typewriter perverts out there. Have a good perve, chaps. I’ll eventually grab a snap of Nadine using the Olivetti Studio 44, that is on her desk. But it is often very fleeting. Other machines to pop up here and there, is an old Remington and a couple of Royal desktops and portables. Now, I feel motivated to write some nasty Melbourne crime…. Or find myself a Rheinmetall on ebay. April 7, 2013 in Dr Blake, Imperial, Remington 17, Rheinmetall, typewriter. Good to see Craig McLachlan's acting has improved greatly since his days on “Neighbours”, but I think it has as much to do with the material as it does with his maturity. I only caught the first half-hour of the other night's episode, but it appears that they are taking the trouble to recreate 1950s Ballarat. Yeah. They certainly did go to a lot of effort. I'm thinking of doing a trip out that way when I (maybe) come down later this year. I believe CM had the unfortunate distinction of being the only person to have featured in every one of the dodgy Australian soaps of the 80's. He was supposedly in 'Sons and Daughters', 'Neighbours' and 'Home and away'. The fact that he can still get gigs kinda indicates that he's either good in bed, or actually did have some level of talent that just was never shown in a soap. It almost looks like Dr Blake has a typwriter specifically sited and lit to make sure it steals the scene. We can now add typewriters to the list of things an actor should avoid working with if he or she wants to avoid being upstaged. I still can't find it in my heart to forgive Australia for exporting Neighbours though. But thanks for Kylie, nonetheless. Rob, you gave us The Beatles, The Stones, and Bond. Kylie was the least we could do in return. We also tried to give you Jason Donovan. But you guys sent him back even less talented, and with a bigger drug addiction than when he left. yes, we had a pleasant little argument along the lines of 'Is it? No, it can't be. Check 1-2? No? Yes, maybe it IS Craig McLaughlan!'. And now we know. I remember when Phoenix was on, it had a strange mix of contemporary suited-cop-vibe and moping, low-key acting. (My memory may be very clouded). But probably well worth catching up on. Certainly not Australia's answer to Miami Vice. I'm not sure I could handle a 'Miami Vice, Australian style', which would surely be held on the gold-coast, with the vice squad busting dealers selling Es to Schoolies kids. Check 1-2… Oh dear. There's some awful stuff that came out of the late 80's that really, really should have stayed there. I sorry to say that I have never watched any episodes of those soapies mentioned above so I kinda came on to CM cold and I found him to be quite good. He certainly has that degree of maturity about him. Apart from the Rheinmetall I spotted a Remington 17 and an Imperial 50 or 55, bit hard to see. As well as identifying typewriters what was the make of the car that he drove? 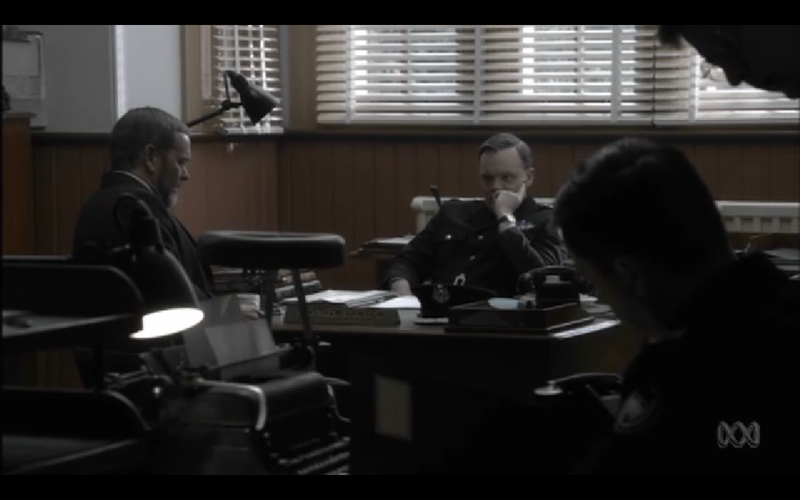 John, on the Doctor Blake website, they have a video tour of the police station set – which gets very close and personal with a particular Underwood 5 which I hadn't actually spotted previously. Oh, now you're testing my limits!